The cruise control system allows you to drive at a constant speed of 30 km/h or higher. – Pull the lever A to position 1, fig. 134 to switch on the system. – Drive at the speed you wish to set the system to. – Press the button marked B to store the speed. The display will indicate the stored speed, and the green symbol 1 will appear ⇒ fig. 135. The display can vary according to the display status. In addition, the indicator lamp 1 in the instrument cluster will light up. A constant speed is maintained by adjusting the engine power or braking the vehicle accordingly. • Always direct your full attention to the road, even when you are using the cruise control system. It is always the driver who is responsible for determining the speed and for keeping a safe distance to the other vehicles on the road. • For safety reasons, the cruise control system must not be used in city traffic, stop-and-go traffic, roads with a lot of bends or in difficult driving conditions (such as ice, fog, loose grit or gravel, heavy rain, aquaplaning) - this could cause an accident! • When you take a turn-off, drive along a motorway exit lane or pass through roadwork sections, please temporarily switch off the cruise control system. • Please make sure you do not unintentionally rest your foot on the accelerator - this will override the cruise control system which, as a result, will not brake the vehicle. • Vehicles with manual gearbox: The set speed cannot be reached if the currently selected gear is too high or too low. Change down to a lower gear if the engine is no longer running smoothly or change up a gear to avoid overrevving the engine. • The brake lights come on when the system brakes the vehicle. – Push the lever A up towards + or down towards -, fig. 134 in order to increase or reduce the cruising speed setting. – Release the lever to store the current cruising speed. You can alter the set speed in steps of 1 km/h by briefly pressing the lever upwards or downwards. When you press and hold the lever, the speed is changed in steps of 10 km/h. You can still use the accelerator pedal to increase speed in the normal way, for example to overtake another vehicle. Once you release the accelerator, the system will revert to the speed you stored initially. However, if the vehicle exceeds the programmed speed by more than 10 km/h for more than 5 minutes, the cruise control system will be deactivated temporarily. 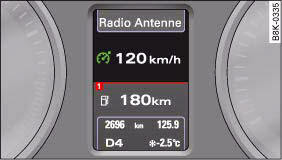 The green symbol in the display will change to white but the stored speed will be retained. You can pre-select a desired speed while the vehicle is stationary. – Switch on the ignition. – Pull the lever A to position 1, fig. 134. – Push the lever up towards + or down - towards in order to increase or reduce the cruising speed setting. – Release the lever to store the cruising speed setting displayed. This function allows you to enter the desired cruise control setting speed ahead of time, for example before joining a motorway. 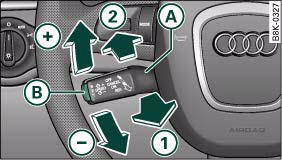 Once you are on the motorway, you can activate the cruise control system by pulling the lever to position 1. – Drive more than 10 km/h faster than the stored speed over a period of more than 5 minutes. – Switch off the ignition. The speed setting will remain stored after the system is temporarily deactivated. To resume the programmed cruising speed, release the clutch or brake pedal and pull the lever to position 1. The stored speed will be deleted once the ignition is switched off. Do not resume the programmed cruising speed if this is too high for the traffic conditions - this can cause accidents.